Hot smoke is twisting its way upward into Peter Bauer’s face, his forehead glossy with sweat. 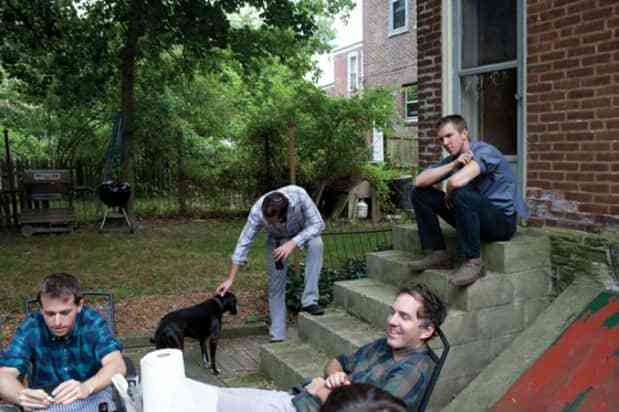 As he fans himself above the maw of the grill, the other four members of The Walkmen sit around his backyard table, waiting patiently to be fed. As sausages and peppers are delivered, Bauer’s five-year-old son Otis comes home after running through sprinklers with friends a few blocks away. They all call him to come hang out for a little while and he does, until he gets bored. It’s quiet except for the occasional clink of silverware on plate, the balmy summer evening maybe dulling the energy, maybe not. “We should really do this once a week," frontman Hamilton Leithauser tosses through the humid air. No one really acknowledges him and he doesn’t seem to mind. Bauer moved to the idyllic Chestnut Hill suburb of Philadelphia with his wife and Otis three years ago. 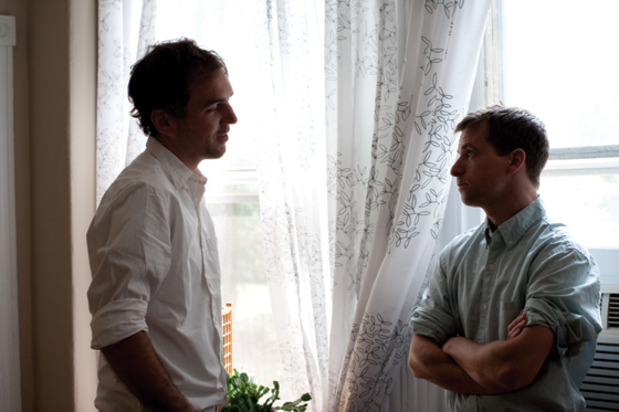 He was the third of The Walkmen to leave New York for Philly, following in the footsteps of guitarist Paul Maroon and drummer Matt Barrick, both of whom left with plans to start families of their own. New York is where the band was born, but now it's home to only two of its five parts, Leithauser and first cousin/bassist Walt Martin still residing in Brooklyn with their wives. Bauer's home sits back several, precariously steep stairs from the tree-lined street, half a row house that he and his wife Marisa have made to feel catalog comfortable. For the past several minutes, Leithauser has been cradling Bauer's infant daughter, Lola, walking and rocking her to the melodies of an old Buddy Holly LP that's filling his bandmate’s dining room. He asks to have his picture taken with her, pats her belly (“a smaller version of Pete’s”) hums sweetly in hopes of teasing out a smile. When pearls of her vomit land flat on his arm, he barely reacts. "She got you," Bauer says as he runs over with a paper towel. "I seriously go through about four shirts a day." 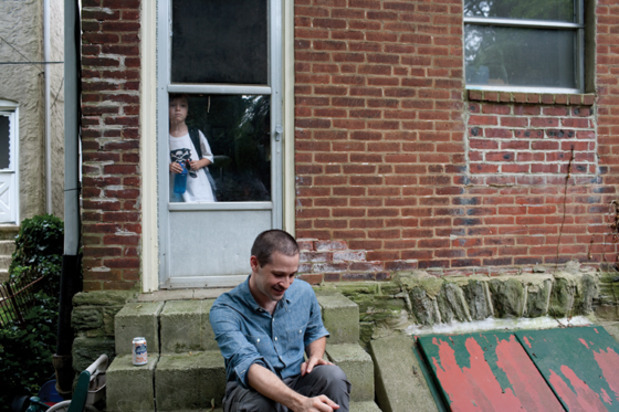 Surveying the sharp new molding that outlines the bar where a kitchen wall once stood, Leithauser muses, "There was a point where Pete was set on moving down here with a wife, a dog, a kid, a nail gun and plan to re-do this entire house." He did. And while Bauer fusses in the kitchen he renovated, conversation between the rest of the guys is seasoned with talk of Lollapalooza, their upcoming fall tour, baby monitors and burping methods. "Otis has grown like a foot in the past year," boasts Bauer. "He's suddenly really skinny." "Daisy likes to sleep and cry," Barrick quips dryly when his wife asks how she’s doing. "We call ourselves 'condo rock,'" Maroon adds with a wry grin. The Walkmen’s fifth album, Lisbon, is arguably their finest full-length yet. It finds them softening in all the right places, bringing in New Orleans-inspired waltzes ("Stranded") and sauntering, country inflections ("Blue As Your Blood") just to name a few of the new wrinkles. It follows on the heels of 2008's You and Me, a haunting comeback effort that saw the band beginning to make music that reflected the growth they were experiencing as men, some with gray hairs and all with wedding bands. The argument over where it belongs in the hierarchy of their catalog depends on how you feel about this mellowing. At the turn of this century, when New York’s new wave of rock bands made the Lower East Side their home base, when The Strokes and Interpol made the streets their catwalks and tenements their headquarters, The Walkmen were anti-fashionable. They stationed a hundred blocks uptown in Harlem. They had no other plans than to write and record enough songs to warrant a release. They just wanted to make classic rock with the "classic" emphasized—all five wielding weathered vintage instruments and Leithauser's graveled yowl sounding as though it had been pulled from oak casks locked in a cellar for 50 years. They quite literally sounded broken-in, or just broken, like merchant marines or grizzled Oxford scholars just back from expedition. Even though they were brand new, it felt like they were imparting some secret wisdoms, something more critical than the downtown kids could offer. Their music was actively ill-tempered when everyone else just seemed really satisfied. It's like we went to anger management. Our rock has a purpose now. This irritability was probably due to their origins. Before they were bandmates, they were friends, neighbors and family, five prep school kids running around Washington, DC. Instead of worshipping cool New Yorkers like Velvet Underground or Television, they shared a fondness for ‘90s Dischord bands and local heroes Fugazi and The Make-Up, fronted by the irascible Ians MacKaye and Svenonius, respectively. They started their own bands and made DC music. Unfortunately, DC is historically incapable of supporting its music, so it only made sense then that when Maroon, Barrick and Martin all landed in New York around the decade's midpoint, they'd continue making DC music together in the Big Apple. They did this as the pre-internet, heavily hyped Jonathan Fire*Eater, a band that for a brief moment filled the post alt-rock void, but dissolved long before they could make the mark most music nerds swore they would. Not long after, Leithauser and Bauer rejoined their old friends. They were almost instantly a self-contained unit. That's where they started and that's how they’ve been since. Lisbon is undoubtedly less testy than all that. There are still large, teeth-gnashing rockers there to sling the record forward. Maroon's guitar still feels hot to the touch and Leithauser's vocals still come forth as if spit up, tobacco and citrus packed tightly inside his mouth. There's greater intimacy, less urgency to their fury. But listening to them age gracefully, it’s hard to tell if they won the argument and are enjoying the victory or have begun to give up the fight. Still lean but slightly less mean, Leithauser in particular has made the transition from screaming in his twenties to singing in his thirties with remarkable finesse. As a result, what felt like being caught in a drunken back alley fight with this band before, now feels like debating the finer points of life, love and the pursuit of satisfaction over single malt neats. "There are great rock songs on this record, but the anger is controlled," Leithauser says. "It's like we went to anger management. You can still be angry, but it's a healthy anger. I think we've just been together long enough, that our rock has a purpose now. We actually have these big rock songs that we're not going to release, songs that would probably be really popular, but they're never going to be heard. Ever. They're just really, really loud—us kicking the door down. But we're tired of it. We've done that." Sitting around the back yard, they don’t look like they’ve changed that much. Theirs was/is disheveled, innately American, ink-stained grad school chic—five guys in V-necks, button-downs and wrinkled monochrome. Ask them how they arrived there all together and they will each describe their collective image in differing ways, all of which intersect and some of which include the following: business casual, Casual Friday, schmucks, jerk-offs, or best of all, mean people. Even today, none of the Walkmen claim they have a uniform "look" or meant to develop one, but like the secret, sometimes silent language they've developed over the years, it just happened anyway. A band by nature, not manifesto. "I am literally wearing the same thing that I was wearing when I was 12," says Maroon as he pinches his charcoal polo at the shoulder. "I have two sweaters and three black pairs of pants. That's it. I went to the gym the other day. I had on a band T-Shirt and a short swimsuit, black socks and dress shoes. That's what I was wearing on the treadmill. I'm really struck by it whenever I see a picture of us then. Five sarcastic jerks. I always think we used to look like such idiots, and I don't know, we just don't look like nice guys. We came off really full of ourselves, I think. It's a shame." More than a gang of jerks, The Walkmen looked like kids with library cards in those early press shots: self-serious, surly, uncomfortable in their own skin, rushed. But there’s no way their group ties or unifying, idiosyncratic sense of humor could have ever translated the way they would have wanted. Maroon later says something at which the punk version of himself in the black-and-white photo would have likely scoffed: “The idea of not having kids makes me so depressed.” He's expecting his second child in January, at which point he and his wife will have already moved to New Orleans, where she's taken a teaching job at Tulane. So this is it. The Walkmen have managed to improve as they've grown older, their hammer-and-cloth approach to writing and recording outlasted the piss and vinegar of their youth. This band used to be their bar, their weekends. Now it's their job.